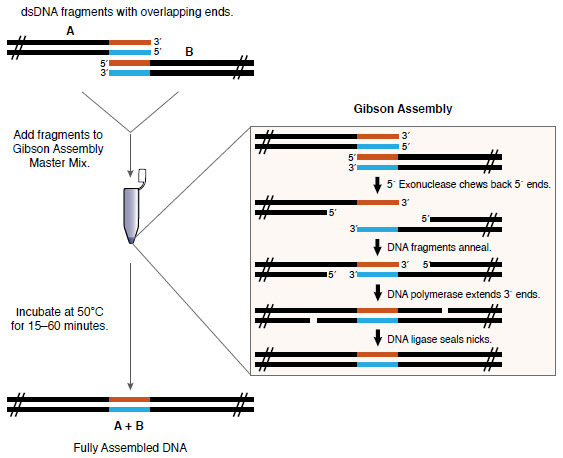 Gibson Assembly® allows for successful assembly of multiple DNA fragments, regardless of fragment length or end compatibility. The proprietary DNA polymerase fills in gaps within each annealed fragment. 10 μl of 2X Gibson Assembly Master Mix was incubated with 6 fragments (5 fragments of 400 bp and one of 2,780 bp, with 40 bp overlap, 0.05 pmol each) in a final volume of 20 μl at 50°C for 60 minutes. NEB 5-alpha Competent E. coli (NEB #C2987) were transformed with 2 μl of the master mix/fragment mixture using the transformation protocol on page 12. Greater than 100 white colonies were observed when 1/10 of the outgrowth was spread on an ampicillin plate with IPTG/Xgal and incubated overnight. Confirm and determine concentration of fragments and linearized vector using agarose gel electrophoresis, a NanoDrop™ instrument or other method. Add fragments and linearized vector to Gibson Assembly Master Mix and incubate at 50°C for 15 minutes to 1 hour, depending on number of fragments being assembled. Transform into NEB 5-alpha Competent E. coli (provided) or use directly in other applications. We recommend Q5® High-Fidelity DNA Polymerase (NEB #M0491) or related products, such as Q5 Hot Start High-Fidelity DNA Polymerase (NEB #M0493) or Q5 Hot Start High-Fidelity 2X Master Mix (NEB #M0494). We highly recommend using our web tool, NEBuilder™ to design PCR primers with overlapping sequences between the adjacent DNA fragments and for their assembly into a cloning vector. The kit is shipped on dry ice. Upon arrival, store kit at -80°C. After first use, store the kit components at indicated temperatures. Insert: When directly assembling fragments into a cloning vector, the concentration of assembly fragments should be at least 2–3 times higher than the concentration of vector. For assembly of multiple fragments into a vector, we recommend using equimolar ratio of fragments. Transformation: NEB 5-alpha Competent E. coli (High Efficiency, NEB #C2987) provided with the kit are recommended for use for assembled products of less than 20 kb in size. It is also possible to use other NEB competent E. coli strains, with the exception of BL21, BL21(DE3), Lemo21(DE3) and Nico21(DE3). For example, Shuffle T7 Express Competent E. coli can be used for the expression of a difficult to express protein. When using competent E. coli from a vendor other than NEB, we have seen decreased robustness of transformation with the Gibson Assembly reaction. Electroporation: Electroporation can increase transformation efficiency by several logs. When using the Gibson Assembly Master Mix product for electroporation, it is necessary to dilute the reaction 3-fold and use 1 μl for transformation. Should you require the use of Electrocompetent cells, please use the Electrocompetent Cells Transformation Protocol. Gibson, D.G. et.al. (2009). Nature Methods. 343-345. Barnes, W.M. (1994). Proc. Natl. Acad. Sci.. 91, 2216-220. How large of a DNA fragment can I assemble? Are there any differences between the Gibson Assembly Master Mix (NEB #E2611) and Gibson Assembly Master Mix included in the Gibson Assembly Cloning Kit (NEB #E5510)? When my Gibson Assembly Cloning Kit arrived, it was stored at -80°C. Will this harm the Gibson Assembly Master Mix? Singh R, Low ET, Ooi LC, Ong-Abdullah M, Ting NC, Nagappan J, Nookiah R, Amiruddin MD, Rosli R, Manaf MA, Chan KL, Halim MA, Azizi N, Lakey N, Smith SW, Budiman MA, Hogan M, Bacher B, Van Brunt A, Wang C, Ordway JM, Sambanthamurthi R, Martienssen RA (2013) The oil palm SHELL gene controls oil yield and encodes a homologue of SEEDSTICK Nature; 500(7462), 340-4. PubMedID: 23883930 , DOI: 10.1038/nature12356.